Well, it’s that time of the year. Time for the Venice carnival or for local carnivals in France. Last year I went to a carnival in Northern France (Longwy), close to the border with Luxembourg called the Longwy-Venitian carnival. And they have a tradition of wearing Venetian style marks and costumes and the setting is an ancient fortress. And, I loved it. And, of course, I wanted to create my own mask (I will need a costume to go with it, but I also bought a sewing machine and there are plenty of tutorials to learn how to use it. Yes, I am really ambitious). Why I love masquerade balls? I think a Masquerade Ball represents our need to pretend for one day to be someone else. To be the best version of ourselves. A mask is always beautiful, sensual, appealing. A mask is the entry in a fantasy world. And also Romeo meeting Juliette at a masquerade ball. As I am a Gemini, I could not help about making a mask that is wearing a mask. 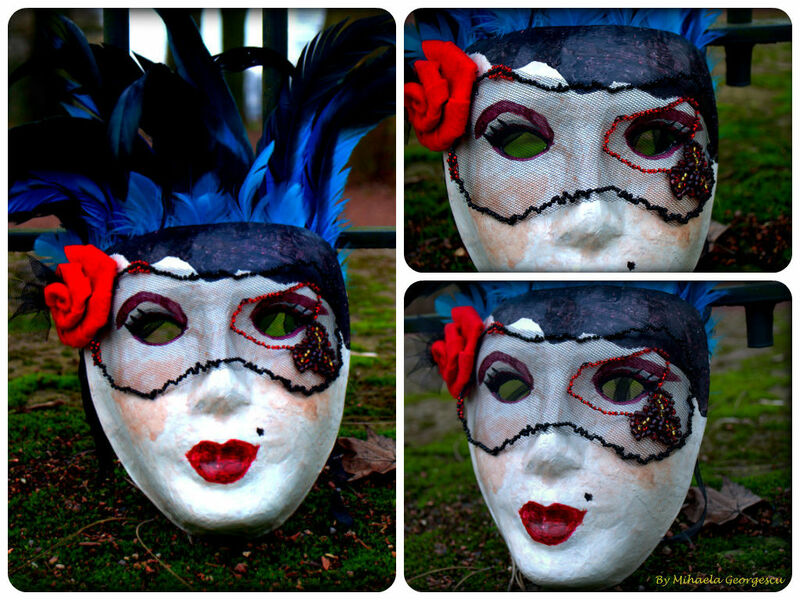 So my mask is wearing a tulle mask embellished with beads (of course)!